What is funk? Some say it’s all about the groove, for others it’s the attitude, the glide in your stride, the dip in yo’ hip. However you define it, here’s an opportunity to immerse yourself in a form of music that’s so primal, it’s like breathing. To paraphrase Allen Toussaint via Lee Dorsey, everything we do gonh’ be funky from now on. This uDiscover feature is where we give the drummer some, and dig down into the roots of this contagiously infectious African-American art form. Funk is the music that married R&B and jazz into a new dance style, built the bridge between soul and disco, and became one of the cornerstones of modern-day hip-hop. The exact starting date of what we call funk is a moving target that’s impossible to pinpoint, but it would be disrespectful to lay most of the credit at anyone else’s door than that of James Brown. The Hardest-Working Man In Show Business who became the self-appointed Minister of the New New Super Heavy Funk surely did more than any other individual to introduce funk music to the masses. Even more remarkably, he achieved that when R&B audiences were being raised on the scintillating soul of Motown, Atlantic and Stax. Those production houses offered utterly brilliant, Top 40 radio-friendly creativity that reached beyond barriers of colour and creed, but Brown’s new dance grooves of his second recording decade were closer to the street than any of them. 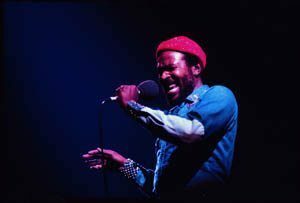 His 1960s output maturing in tandem with his socio-political profile as the spokesman for a generation, Mr. Brown injected his music with a taut, badass grittiness that had never been heard before. As the man said himself, he only got a seventh-grade education, but he had a doctorate in funk. As this new hybrid started to make fingers snap and toes tap, it became obvious that funk was more about an insistent beat and an irresistible, often extended groove than it was about the traditional verse-chorus song structure that it grew out of. 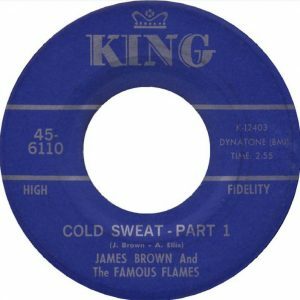 Brown was getting there by 1967’s ‘Cold Sweat’; four singles later, by the time of the R&B chart No. 1 ‘I Got The Feelin’’ in the first months of ’68, he was all the way there and halfway back again. Meanwhile, by the late 1960s, funk was manifesting itself in various incarnations all across America. 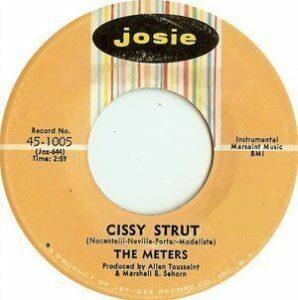 In New Orleans, it was championed by the Crescent City’s favourite house band, the Meters, who exploded in ’69 with their goodtime workout ‘Cissy Strut.’ Later, the city offered proof positive that white boys could play that funky music, with Dr. John’s ‘Right Place, Wrong Time,’ produced by aforementioned Nawlins ambassador Toussaint. That helped 1973’s parent album ‘In The Right Place’ become the biggest of Mac Rebennack’s life. 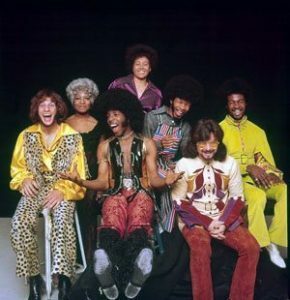 In San Francisco, the funk was altogether more narcotic in mood, in the hands of Sly and the Family Stone, who got funkier as they went along, culminating in the magnificence of 1970’s ‘Thank You (Falettinme Be Mice Elf Agin),’ steered by Larry Graham’s liquid basslines, which wriggled uncontrollably and are still wriggling today. In Chicago, Curtis Mayfield graduated from the soft soul of the Impressions to the sassy, inner-city hustle of the ‘Superfly’ soundtrack. And then…there was P-Funk. George Clinton had been paying industry dues since the late 1950s, notably with the Parliaments, who were just too loose-limbed and groove-oriented to fit neatly within the soul parameters laid down in the first half of the 1960s. 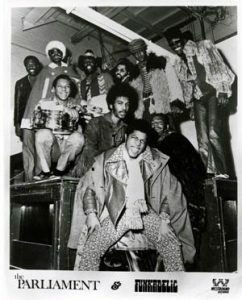 Under his aegis, both the newly-named Parliament and the equally formidable collective Funkadelic made their album debuts in 1970. By the time former James Brown bass protégé Bootsy Collins cut loose to don his star-shaped specs, to be joined on this new space-funk mission by fellow Godfather acolytes Maceo Parker and Fred Wesley, the mothership was ready for take-off. Parliament, Funkadelic, Bootsy’s Rubber Band and female spinoffs the Brides of Funkenstein and Parlet became the embodiment of mid-to-late 1970s funk with huge-selling new standards such as ‘Tear The Roof Off The Sucker,’ ‘Flash Light’ and ‘One Nation Under A Groove.’ As Clinton’s fellow founder Bernie Worrell once observed, Providence School of Art students used to sneak into P-Funk concerts. All the while, Brown himself was still the man to catch, setting the red-hot pace with a blinding run of R&B chart-toppers that included ‘Super Bad,’ ‘Hot Pants,’ ‘Make It Funky,’ ‘Get On The Good Foot,’ ‘My Thang’ and ‘Funky President’: the list was almost endless. It also included the earlier ‘Funky Drummer,’ one of JB’s most modest single hits, which is hugely ironic when you factor in the mind-boggling number of (largely illegal) samples attracted by the Clyde Stubblefield break, in the early days of the burgeoning hip-hop sound. Collectives such as Earth, Wind & Fire and Kool & the Gang could funk with the best, even if they frequently focused on smoother soul crossovers. 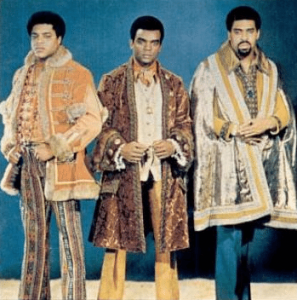 The Isley Brothers, for their part, came off the Motown production line and changed into something much more comfortable, based around Ernie Isley’s funk-rock guitars. Another large unit that managed to sound both earthy and commercial were Long Beach’s Latin-leaning funk-rock team War. In an incredible decade of success, hits like ‘Me and Baby Brother,’ ‘Low Rider’ and the disco-era ‘Galaxy’ fizzed with percussive excitement. Then there were the Ohio Players, who squirmed to the very top of the R&B tree with ‘Funky Worm,’ among a plethora of skintight workouts. Every city in America had its 1970s funk heroes, some of them even with the genre in their name. Vallejo, California collective Con Funk Shun were R&B chart residents in the late 1970s and early ‘80s with their horn-fuelled variety, on a mission to ‘Confunkshunizeya’ and have plenty of ‘Ffun’ in the process. The Bar-Kays, originally from Memphis, transmuted from Volt label ‘60s soulsters into the finger-snapping dudes of 1976’s ‘Shake Your Rump To The Funk,’ and Tower of Power became Oakland, California’s funk flag-bearers. The dawn of disco could have seen funk off, with its insistence on four-on-the-floor patterns and increasingly regimented beats per minute. But in the early years down at the discotheque, the two forms lived in glorious symbiosis. In Miami, TK Records built on its early success with George McCrae and KC & the Sunshine Band to break some bands now largely forgotten, but popular in their brief late-‘70s glory, such as T-Connection and Foxy. 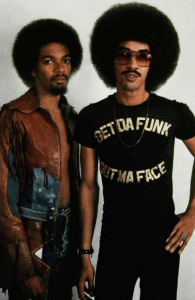 The Brothers Johnson, Los Angeles siblings George and Louis, came to the genre from the jazz-soul side of town, under the tutelage of producer-mentor Quincy Jones. They often favoured a more pop-friendly form of R&B, but pushed all the buttons for 1976’s vibrant ‘Get The Funk Out Ma Face,’ talkbox and all. Meanwhile Crown Heights Affair, labelmates of Kool & the Gang at De-Lite and named for their New York locale, rode the disco wave with ‘You Gave Me Love,’ and in Dayton, Ohio, Roger Troutman’s band Zapp took the P-Funk prototype and gave it more bounce to the ounce. Jazz-funk developed a momentum of its own in the late 1970s and early ‘80s with the likes of Roy Ayers, George Duke, Dexter Wansel and other studied players, and via British descendants including Level 42, Light Of The World and countless others. But disco was changing, and swiftly ceding ground to a harder urban dance sound, as rap and hip-hop came to power in a new electronic world. 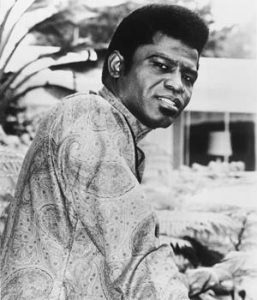 When James Brown observed in 1979 that ‘It’s Too Funky In Here,’ he was using one of the other meanings of the word, about the tang in the air rather than the musicality. Nevertheless, for all the efforts of hitmakers such as Cameo and the Gap Band, funk was undoubtedly emaciated as the ‘80s progressed. Since then, the legacy of the music can be heard far and wide, if not always overtly. Independent soul labels with one ear to the future and the other to the past, such as Brooklyn’s Daptone, have championed the sound via the work of Sharon Jones & the Dap-Kings, Charles Bradley and others. Two miles up the block in Williamsburg, Truth & Soul does the same with the likes of Lee Fields, while the sound of the ‘70s comes back to the pop charts in the Anglo-American affiliation of Mark Ronson and Bruno Mars. You can’t fake the funk, but the spirit of this pulsating music is alive and well. “Is there funk after death?”, asked Parliament. Depend on it.